Never before has helicopter flying been so affordable and safe. With the new generation coaxial rotor system – patented in USA and Italy already – eliminating the requirement for a conventional tail rotor, the new RotorSchmiede VA115 ultralight is a very safe helicopter. The autorotation characteristics of the co-axial rotor system coupled with innovative design features like the new freewheel unit, centrifugal clutch and blade locking system are all important measures towards safer flight operations. As a full-fledged helicopter with outstanding flight characteristics, the RotorSchmiede VA115 ultralight positions itself clearly above the gyrocopter scene. RotorSchmiede takes pride in the fact that its VA115 is the first program to receive an official approval based on the new Ultralight Helicopter Regulations (LTF-ULH). After German Government implemented the new regulations at the end of 2016, RotorSchmiede applied for an Ultralight Helicopter Type Certificate. The Deutsche Ultraleichtflugverband e.V. 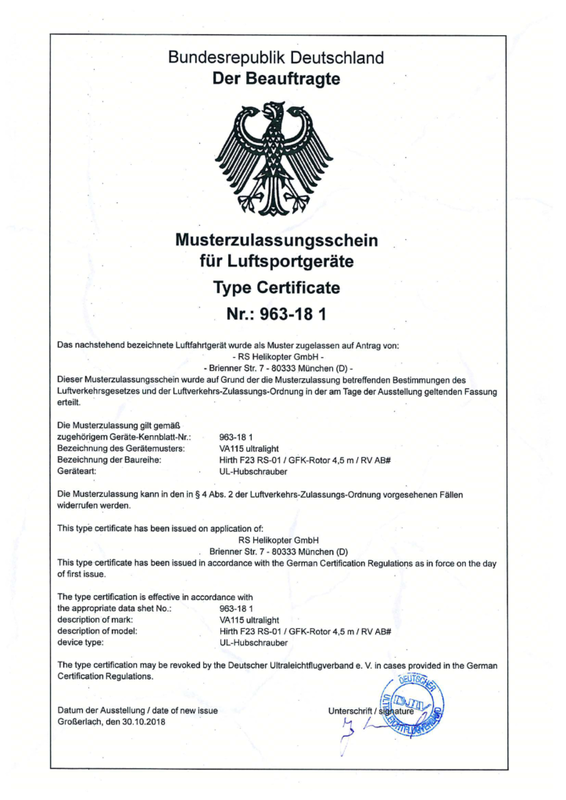 (German Ultralight Aviation Association DULV) issued the “Permit to Fly” within only four weeks, based on RotorSchmiede’s prior close cooperation with DULV. The first VA115 prototypes were used for extensive trials with Component / Subsystem and Ground Testing which has led to the issue of the “Permit to Fly” by the DULV. Prototype PT002 with registration D-MPVA entered flight testing. At the end of October 2018, the DULV granted RS Helikopter GmbH the Type Certificate for the coaxial helicopter RotorSchmiede VA115 ultralight. At the end of October 2018, the Deutsche Ultraleichtflugverband e.V. (German Ultralight Aviation Association DULV) granted RS Helikopter GmbH the Type Certificate for the coaxial helicopter RotorSchmiede VA115 ultralight.